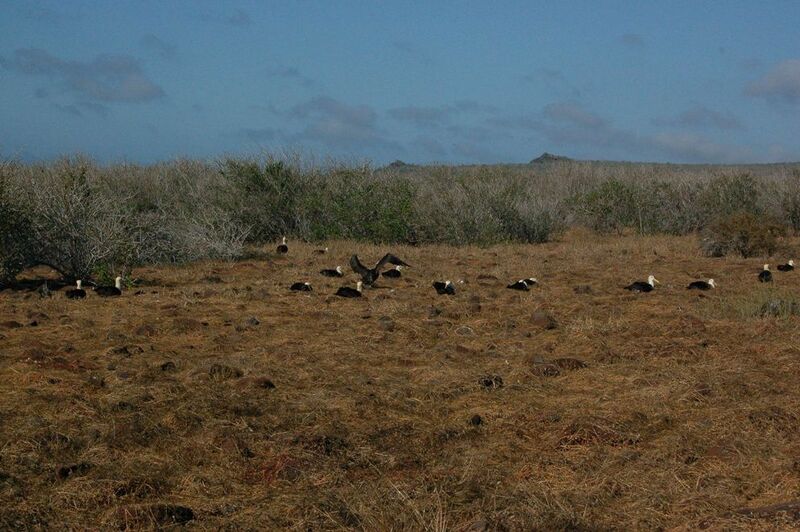 This is a most exciting time of year for Punta Suarez on Espanola Island. 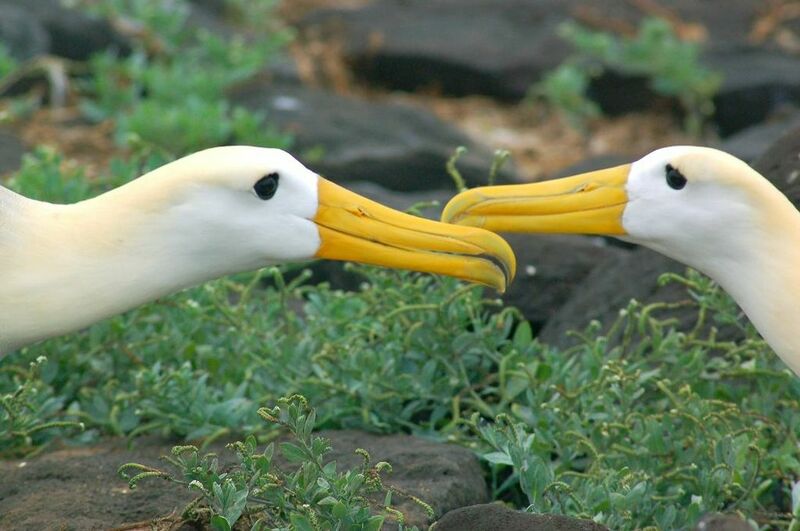 Though there is never a bad time to visit this island, in springtime, visitors get to see all of the Waved Albatross in the world settle here, engage in their ritual dance, mate, and care for their babies. I've written about Punta Suarez before. See that post, here. And, I'm sure you'll hear more about it again, because it differs from season to season. Sometimes the blue footed boobies' nursery is the centerpiece. Now though, in springtime, it's the amazing, wondrous Waved Albatross. Here's one now - greeting us head on - completely unafraid - posing for the camera. 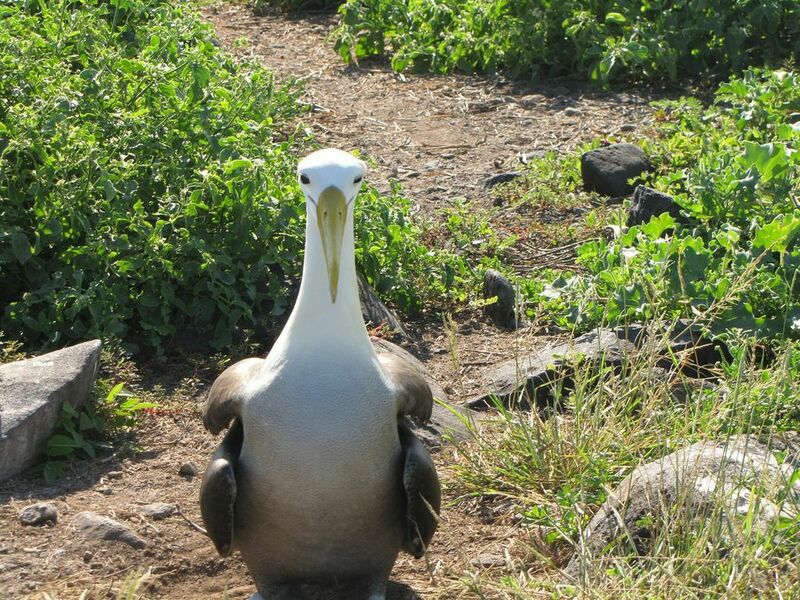 Mariners have long associated albatross with good luck because when a sailor sees an albatross, land is near. If you visit Punta Suarez on Espanola Island from the beginning of spring through November, and see these dramatic and unique birds, you’ll believe that they bring good luck too. Your landing by panga on Espanola will barely hint at the wonder you are about to experience. The initial path is rocky and dry, typical of the volcanic formation of the Galapagos Islands. 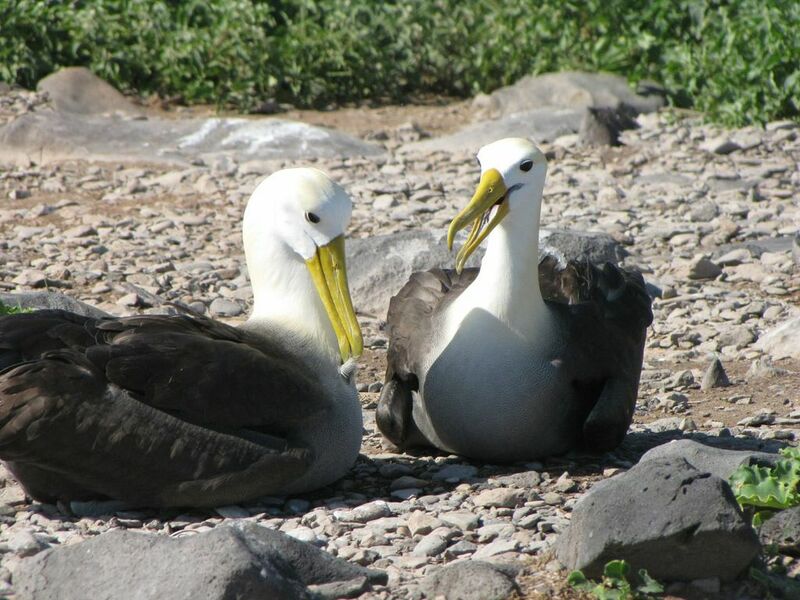 Soon though it opens up to a gorgeous view of the Pacific Ocean, pounding seas, dramatic blow holes, and, most special of all, the world’s only Waved Albatross mating area. The species of albatross that you will see is called the Waved Albatross. About the size of a large turkey, Waved Albatross are the largest birds in Galapagos, an archipelago literally teeming with bird life. Espanola is the only place in the world where Waved Albatross mate. 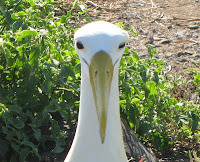 What Do Waved Albatross Look Like? 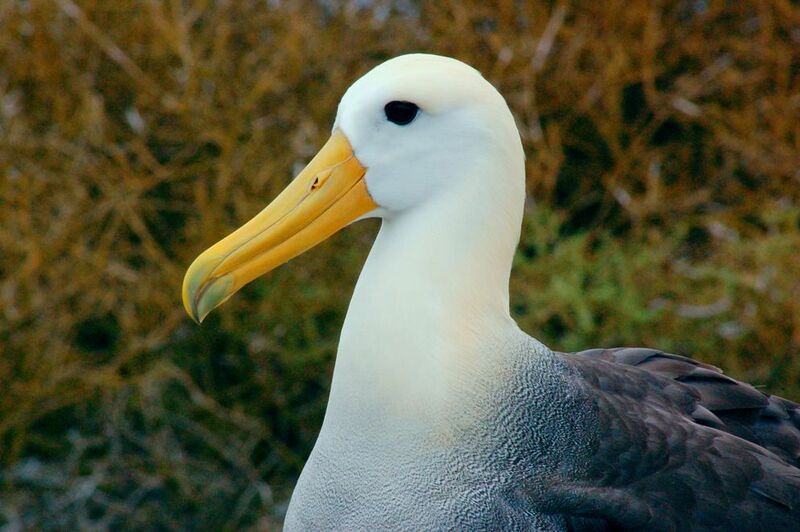 Adult albatross heads, necks and under wings are white or yellowish. Their bodies are grayish, brown and sienna colored. Their feet are bluish and sort of long for their bodies. Their bills are yellow. 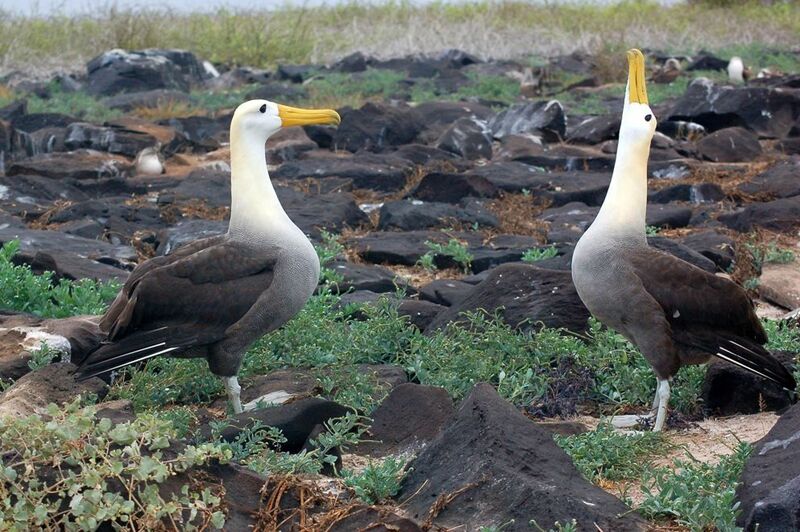 They get the name Waved Albatross from the delicate wavelike pattern of their body feathers. Though aerodynamically perfect for gliding, Waved Albatross on land are a bit funny looking and they can be a awkward when taking off and landing. If land were not a necessity for breeding, they would probably never touch down at all. Considering that they are based on a really rugged and rocky terrain, it’s easy to understand why land is not their preferred habitat. 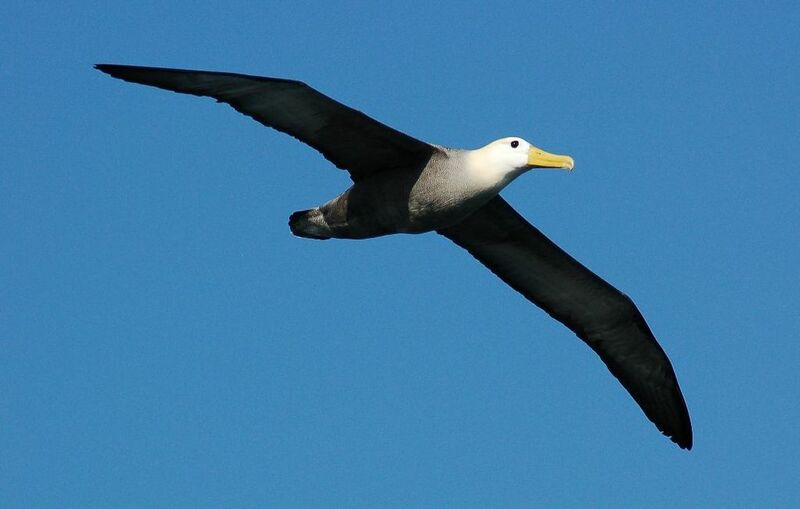 Because their strength is in gliding and finding food at sea, their wing span is very long, 7 feet in fact. While on land, these birds have to find an area big enough to flap their wings on take off and to stop without stumbling upon landing. The way that they handle the take off is literally to jump off the cliff. They take that initial leap of faith, flap their wings, the current takes them and off they glide. Now, the landing can be a little bit more treacherous and I’ve seen many coming in for a landing full force, and stumbling on touchdown. But, they don’t get hurt. 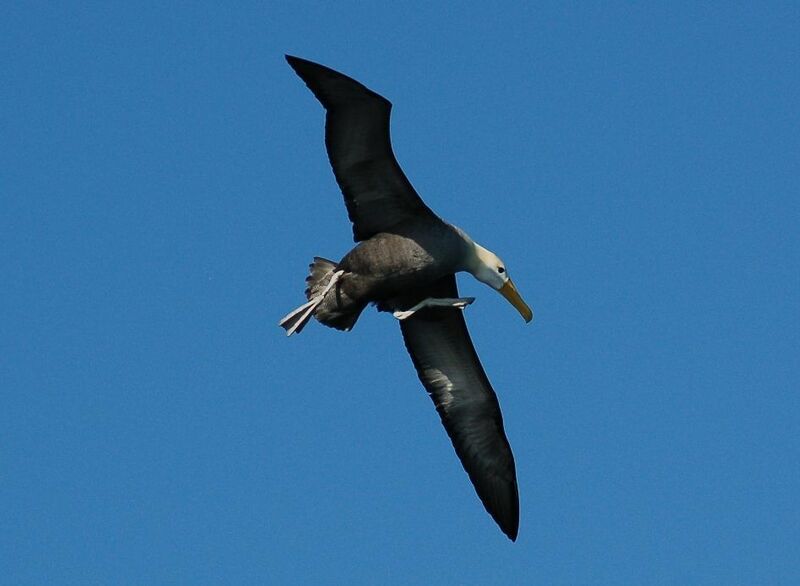 Once in flight, Waved Albatross are perfect graceful gliders and can go for long distances on the wind current. Catching the wind, they are truly glorious to behold. They fly by dynamically soaring on the wind currents. They can stay aloft for months at a time, diving down for food and landing only during breeding season. This raises a peripheral question. When and where do these large birds sleep? No one really knows. While some scientists believe that they take short naps when they land on water as they feed, I personally subscribe to another scientific theory. Like dolphins, one of their brain hemispheres may sleep at a time, keeping them conscious and on autopilot always. One thing is certain, because most of the time they glide on wind currents, rather than flap their wings, they really don’t use much energy to tire themselves out. 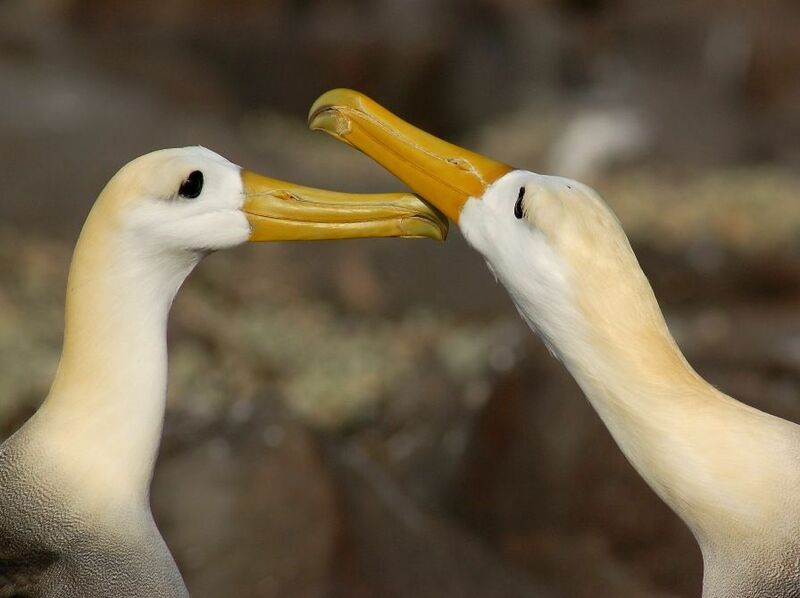 What Do Waved Albatross Eat? The birds are pelagic, meaning that they are sea going. They get most of their nutrition from squid, small fish and crustaceans that can be found on the ocean surface. They also are pirates. I’ve seen them many times stealing food that other birds, especially the blue footed boobies, have caught. This behavior is called kleptoparasitism and it’s not unusual in the bird kingdom. It’s a way that different species have become co-dependent and have learned to live harmoniously. Fortunately, there’s plenty of food to go around. The chicks eat from their mother’s and their father’s beaks, the parent regurgitating its food and making it palatable for a young and undeveloped tummy. In one feeding, a chick can eat up to ½ gallon of oily fish. 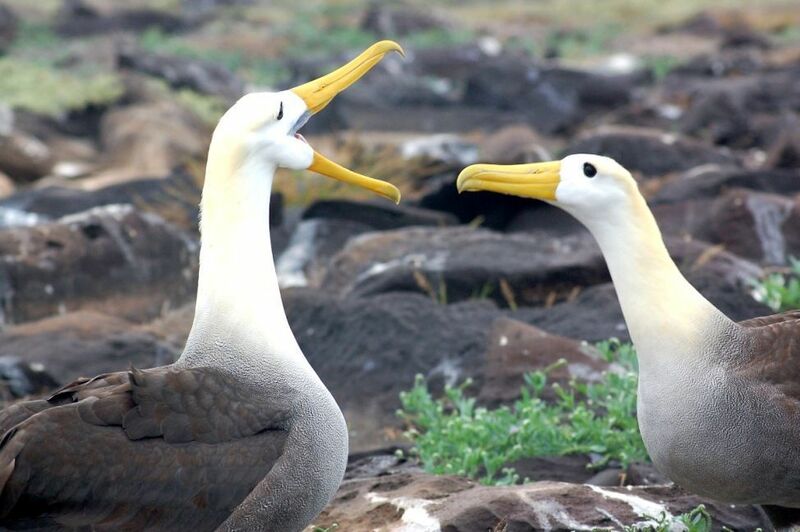 The most exciting part of Waved Albatross behavior is related to their mating patterns and how they raise their young chicks. Though most of the time they are flying, gliding and eating, about 12,000 Waved Albatross pairs land each year on Espanola to mate. 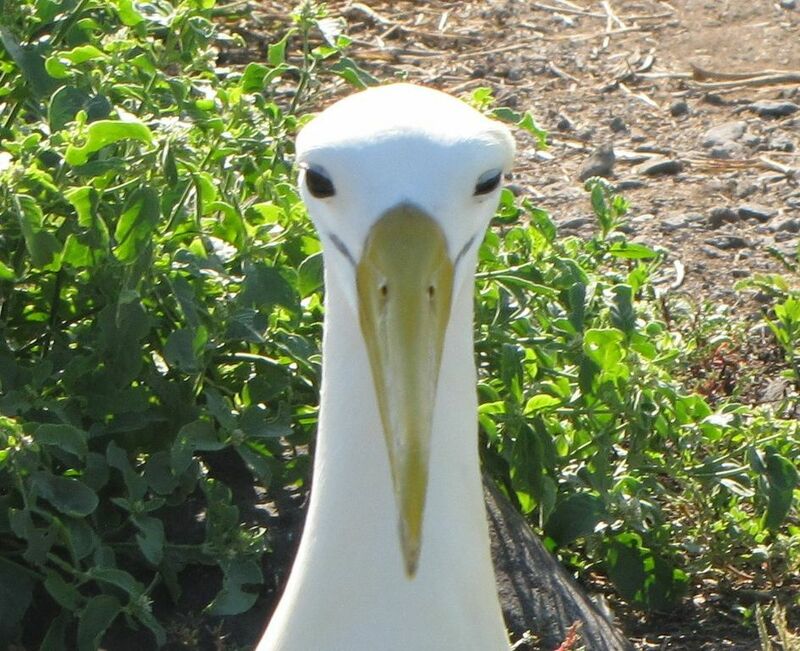 Albatross live to be about 50 years old and start mating behaviors at age 6. Thereafter, they keep that same mate for their entire lives. They don’t spend the interim time together, but somehow each spring the couples find one another again. The males arrive first, patiently waiting for their female counterparts to show up. We’re not sure how they know each other, but just because they all look pretty much the same to us, doesn’t mean that they don’t have some innate concepts of attraction that bind them together. Maybe they are looking for good providers, as mutuality is an important part of their life together. Interestingly, when a juvenile pair first meets, it’s not necessarily love at first sight. Mating usually does not occur even in the first year of their meeting. Their initial courtship is a drawn out ritual and might last two seasons before the pair actually mates. 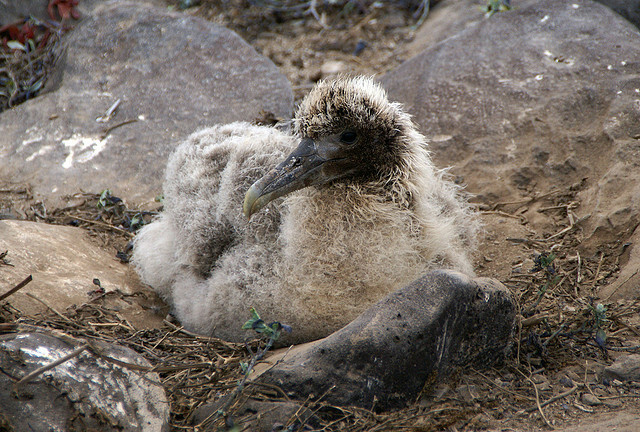 In the height of mating season, Espanola is literally teeming with albatross and the noise can be deafening. 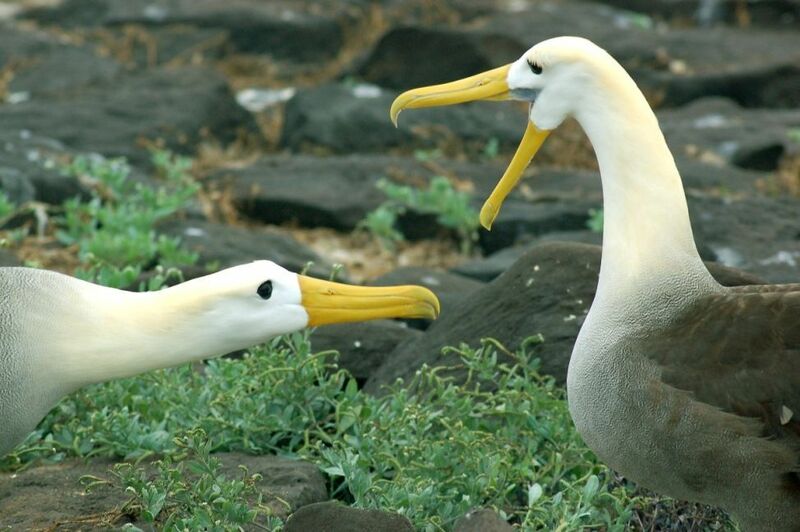 The coming together of an albatross pair and their mating ritual is a long involved and intricate process. It includes loud plaintiff whoops and lots of clacking of beaks. The sound when 12,000 pairs are meeting together is a cacophony – loud, deliberate, distracting and fascinating all at once. They spend a lot of time preening and nibbling at each other. A male courting a female will dance with his beak raised – called sky pointing - and his massive wings outstretched. The female, in turn, bows and flaps. They both bow, gaze into each other’s eyes, and stand on the tips of their feet. When they do mate, Waved Albatross do so quite gently. A female lays only one egg, which is then tended to by both of the partners. The egg is laid in a depression in the hard volcanic earth. The partners will take turns sitting on and protecting the egg from their only predator, the Galapagos hawk and also keeping it warm. 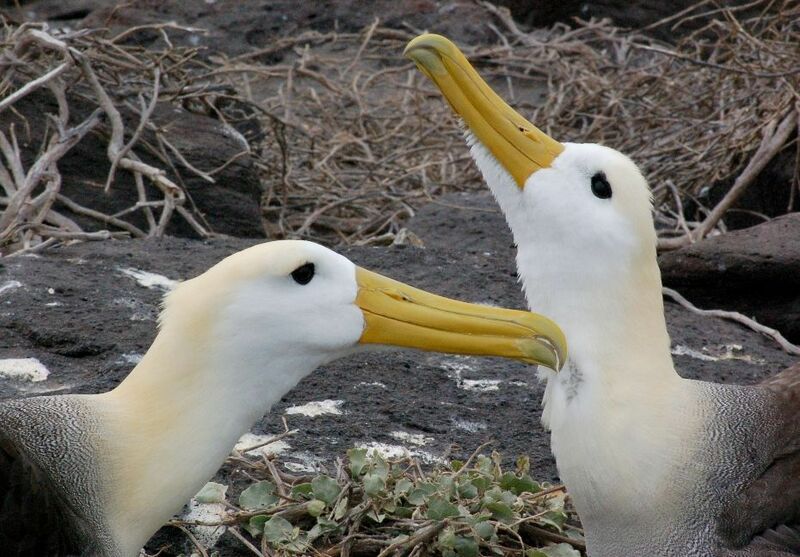 While one watches the egg, the other will go out to sea for as long as two weeks at a time to eat and glide. It takes more than two months for the egg to incubate. Finally a downy hatchling emerges, with spiky soft grayish blackish brown feathers. The parents will care for the newborn for only two weeks before leaving it in a baby nursery where it will grow and, hopefully, prosper. The parents come back at regular intervals to feed the chick. It takes about 167 days before chicks can fly. Of course, they must shed the fluffy black feathers and develop adult markings. They must get strong, which they do by raising their bodies a little bit more off the ground every day. Their wings have to develop so they exercise. They take some stumbling steps around the boulders, learning about the terrain and how to use their spindly legs. The first actual attempts at flight will make you laugh. The little babies are so awkward. Where do I put my feet? What am I supposed to do with these long wings? How do I avoid stubbing my toe on a boulder? Am I going to fall right off of that giant cliff? Who knows what goes through those bird brains? What we do know is that after a few stumbling efforts and falls, the six month old catches the wind and glides off as though he’s been doing it all of his life. It will be six years before he returns to his childhood home to start the cycle of life over again.